The eastbound and westbound ramps from Interstate 30 to Texas 360 in Arlington are closed due to two jackknifed tractor-trailers, police say. The eastbound and westbound ramps from Interstate 30 to Texas 360 in Arlington were closed Tuesday afternoon due to two jackknifed tractor-trailers, police say. 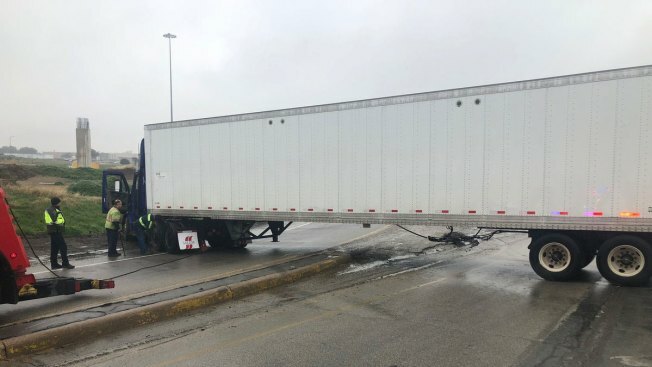 "Commercial Vehicle Enforcement inspectors are on scene investigating what happened and trying to get the ramps back open," police said in a tweet at about 1:15 p.m. Drivers hoping to get to 360 north or south can use Collins Street or Texas 161 as an alternate route. The ramps reopened at about 5 p.m.